Protein is an essential nutrient that supports the structure and function of the human body. It builds, strengthen, and repairs your organs, muscles, bones, and blood. Protein is also necessary to make hormones, enzymes, and antibodies. The protein in your breast milk is important for your baby's growth and development, but it also helps to protect your baby from illness. In the first few days after your baby is born, your child will get colostrum. There may only be a tiny amount of this first breast milk, but it's packed with nutrition including easy to digest protein. 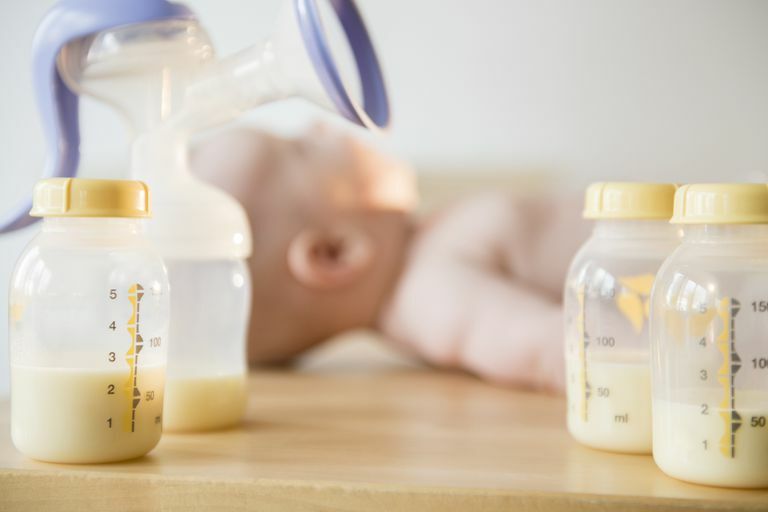 As your breast milk comes in and the colostrum changes over to transitional milk and eventually mature milk, the amount of protein goes down. As the months go on, the protein continues to drop. There are two types of protein in human breast milk: casein (curds) and whey. Whey proteins are liquid and very easy to digest. Whey also contains antibodies, lactoferrin, and lysozyme which help your baby fight off infections and disease. Casein proteins are larger more complex protein molecules that are harder to digest. When your baby is first born, your breast milk contains close to 90% whey protein and about 10% casein. When your breast milk comes in and becomes mature milk, it has about 60% whey and 40% casein. And as the time goes on, the whey protein continues to drop until there's about the same amount of both whey and casein later in lactation. Amino acids are the building blocks of protein. When protein is digested in your baby's stomach, it breaks down into amino acids. There are over 20 different amino acids found in breast milk. Taurine is one of the amino acids in breast milk. And, while there are large amounts of taurine found in breast milk, it's not found in cow's milk at all. Studies show that taurine has many functions, including combining with bile acids and playing an important role in brain and eye development. Some of the other amino acids found in breast milk include glutamic acid, cysteine, lysine, phenylalanine, tyrosine, and methionine. Lactoferrin is a part of the whey protein. It's an iron-binding protein that attaches to iron and transports it throughout the body. But, that's not the only function lactoferrin. Lactoferrin stimulates the immune system and helps breastfed babies fight off the organisms that can cause bacterial, viral, and fungal infections of the gastrointestinal tract. If your child is born prematurely, your breast milk will have even more protein, specifically whey protein. This high amount of easily digestible protein is so important to a premature baby who's intestines are still maturing. The lactoferrin, immunoglobulins, and other immune properties in whey protein also help to protect preemies from intestinal infections. Infant formula has as much or more protein than breast milk. However, the protein in formula is not the same as the protein in breast milk. Formula, especially cow's milk-based formula, has more casein and less whey. So, even though breast milk may contain less protein, the protein that it does have is more easily digested by the baby and, therefore, used more efficiently.